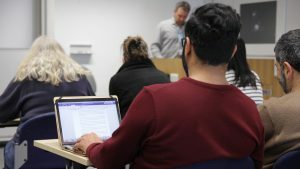 The initial Digital Accessibility course with content from all the partners and the specialist course on Inclusive Learning and Teaching from the University of Southampton have been made open to the general public via the FutureLearn platform. The content of the courses has been made available under a Creative Commons CC-BY-40 licence and is available in a Google Open Education Resources folder which means they can be re-purposed for others to use in different circumstances. This process has already started to occur with language translations, flipped classroom presentations, use on web pages, conversion into slides and posters for lectures, conferences and international meetings. This meant there were up to 7 comments per learner over the two runs, when the average is usually around 5. It is also usual for only 10% who start a MOOC to finish the course, but in the case of the Digital Accessibility MOOC combined runs this figure was 17% with over 750 learners actively engaging till the end. It is also interesting to note that as a result of the 695 learners who filled in the pre-course survey there was a swing from an older age range attending the first run compared to the second run, so it is hoped that those in management were perhaps asking younger colleagues to attend having registered on the first run. There was also a question about employment in the pre-course survey and 609 learners showed that overwhelmingly the majority of those completing the survey were in teaching and education (152 replies) and IT and information services (115) followed by public sector (51) and health and social care (38) with 400 females and 289 males filling in the survey. The team turned to the comments for more concrete evidence about views in terms of engagement and found there 8,318 comments were made during the first run and 8,419 comments made during the second run. The positive outcomes from the 2 runs of the introductory course has meant that there will be a third run starting on October 9th 2017. The impact of the Inclusive Learning and Teaching specialist course has yet to be truly understood as the analysis of the comments and other data has yet to be undertaken. However, 2,925 individuals registered on the course and they came from 136 countries. This was despite the fact that the course was specifically for those in Higher Education and mainly about inclusion in teaching and learning environments in UK. Those who became active learners numbered 1,445 generating 5,297 comments. The course contents are being re-used for mini courses and also as teaching and learning materials in class. More work has yet to be carried out to make the most of the open educational resources but some are in the process of being taken across to other formats and repurposed for example slides will be developed using the Slidewiki project decks. The slides will initially be used for an MSc course module “COMP6219 Designing Usable and Accessible Technologies“.